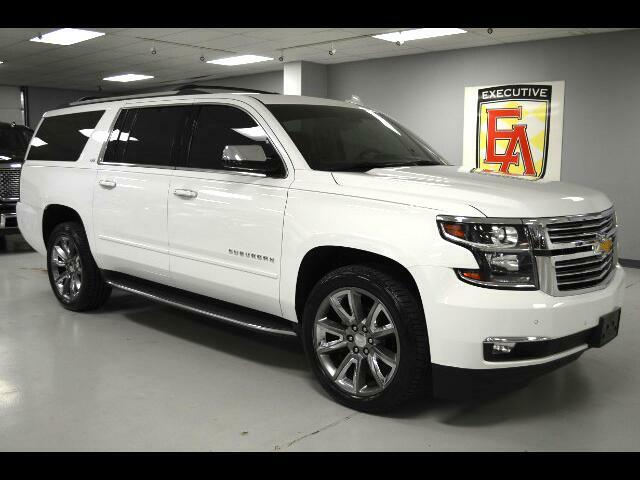 2015 Chevrolet Suburban LTZ AWD Summit White with Cocoa Mahogany Perforated Leather ONLY 19K MILES Options Include: SUN, ENTERTAINMENT, AND DESTINATION PACKAGE (Power Glass Sunroof, Second and Third Row Blu-Ray/DVD Screen, Chevrolet MyLink with Navigation Audio System), MAX TRAILERING PACKAGE (3.42 Rear Axle Ratio, Integrated Trailer Brake Controller, Autotrac 2-Speed Active Transfer Case), 22 INCH WHEELS WITH PREMIUM PAINT FINISH AND CHROME INSERTS WITH BRAND NEW MICHELIN TIRES, CHROME ASSIST STEP, ADAPTIVE CRUISE CONTROL, BACK UP CAMERA WITH GUIDANCE LINES, MAGNETIC INDUCTION WIRELESS CHARGER, BLUETOOTH PHONE AND AUDIO CONNECTIVITY, QUAD SEATING, HEATED AND VENTILATED FRONT SEATS, BLIND SPOT MONITORING, LANE DEPARTURE WARNING, PARKING ASSIST, HEATED STEERING WHEEL, TRI-ZONE CLIMATE CONTROL, BOSE AUDIO, MEMORY DRIVERS SEATS, POWER FOLDING EXTERIOR MIRRORS, ROOF RACK CROSS RAILS, SMART KEY ACCESS WITH PUSH BUTTON START. Contact Kyle Porter at 816-616-2500 or email: kyle@executiveautomotive.com for additional information. Thanks for your interest in our Suburban!